I have the worst luck with vacuums. Either they do not have enough suction, they damage my carpet, they irritate our allergies or they just don’t last! I heard about the LG Kompressor Compact V250C’s PetCare Vacuum and had to try it! Take a look at these features and specs and you can see why. At just 16.5 pounds, the LuV250C is the lightest vacuum in LG’s vacuum family with all the power of the full-size vacuum. The LuV250C also features an extra-long 30-foot cord, making it easier to clean a larger area in less time without having to switch outlets multiple times to reach the entire space. The adjustable telescopic handle collapses for more compact storage and the lighter weight makes it easier to manuever around your home. Available in an attractive Cinnamon finish, the LuV250C features a stylish design that makes it a great fit anywhere in the home. LG Kompressor Compact PetCare Vacuum ® Technology utilizes the world’s first motorized compression system to condense the dust intake to hold three times more household dust than non-compressor models. 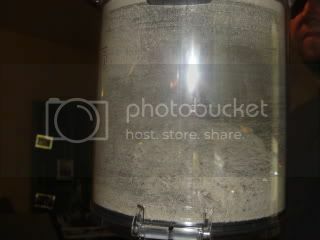 The Kompressor® system uses a unique wiper blade within the bag-less bin to keep it clean while compressing dust intake. This allows you to store up to 3 times more dirt, dust and pet hair vs. non-compressor models and means there’s an easy-to-dispose-of cake of dust when you empty it. DualForce™ Suction Technology adds two additional air pathways to pick up from both sides of the vacuum head in addition to the traditional center section. This allows you to capture dust and debris over a wide surface area, and is ideal for picking up dust in hard-to-reach edges. The Pet Hair Turbine tool uses an air turbine powered brush to remove pet hair embedded in furniture and carpets. Its True HEPA filtration system help capture dust mites, pollens and other common household allergens to deliver a higher degree of freshness in the home. Part of me was skeptical that it would live up to it’s promises. But my husband and I were excited to put it to the test. When we unpacked it I was excited to see that it really was lightweight! It is light enough for me and the kids to use. 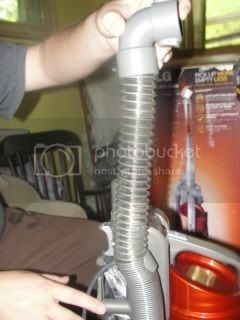 It only took minutes to to put together.Here is the vacuum after we had snapped it together. The hose and the bag-less bin are clear so you can see the vacuum at work. 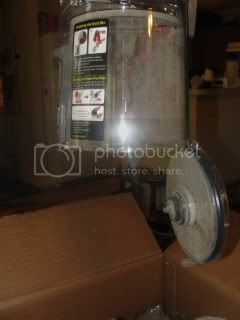 One of my favorite features of this vacuum is the “Kompressor” system that uses a wide wiper blade to pack the dirt and dust tightly in the bag-less bin. I could see it working and was amazed. It is funny that we have no idea how dirty our carpet is until we have and GOOD vacuum to show us! 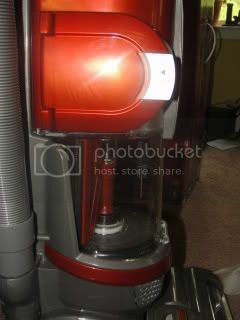 The DualForce suction allow this vacuum to pick up more dirt than a typical vacuum. I seriously could not believe how much dirt and dust was sucked into the LG Kompressor! I had to show a close up of the collection bin. You can see it is FULL of dirt and dust. I am shocked that all of that was on my living room floor. Just 3 days prior I had used my “other” light stick vacuum. Look how much was not picked up by the other one and the LG picked up! As a mom of a asthmatic and allergy sufferer this thrilled me! I was shocked what we were walking and sitting on and breathing everyday. You can see above also how easy it is to dispose of the dirt. It is so nice to not have a bag to deal with. 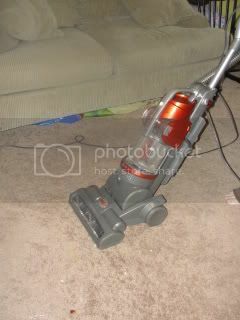 I hate when I empty a vacuum and get half of the dust on me, on the floor or back in the air. The LG Kompressor Vacuum makes the clean up super simple and clean! You simply press the button and the bottom drops letting out all the dirt. The blade does such a great job of packing the dirt together and it shows when you empty it. 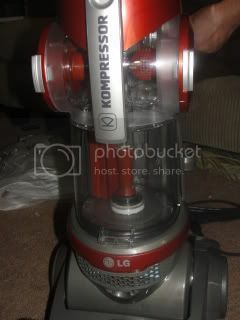 Overall the LG Kompressor Compact PetCare Lightweight Vacuum is awesome! The best vacuum I have ever owned! I have already suggested it to all of my family and friends. 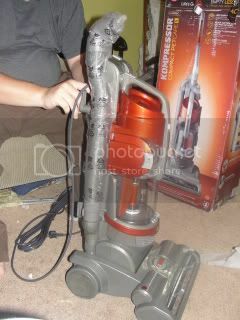 If you are looking for a vacuum that gets up ALL of the dust and dirt every time this is the one. This is the perfect vacuum for every home. IF you have pets or allergies the hepa filter and kompressor system makes this the perfect vacuum for you. If you are a mom that wants clean air and a clean home for your family this is the vacuum for you! Look no further! 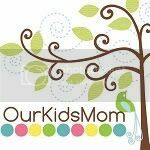 See what Our Kids Mom, A Moms Take, Just Married with Coupons and This Mama Loves Her Bargains thought about the LG Kompressor Compact Lu V250C Lightweight Vacuum. YES We are giving away a vacuum! LG is giving away a LG Kompressor Compact Vacuum just like I reviewed! I received this vacuum for the purpose of this review and campaign. This campaign is being cross promoted through Shout! Media.